The coolest thing on the shirt: an Italian flag which ends in a pocket. 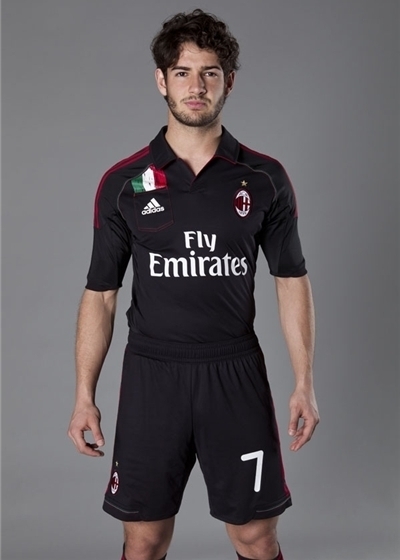 Pato wearing the shirt during its launch. -The club was founded as a football and cricket club on 16 December 1899 by English expatriates Alfred Edwards and Herbert Kilpin, who came from the English city of Nottingham. In honor of its English origins, the club has retained the English spelling of the city's name, as opposed to the Italian spelling Milano which it was forced to bear under the fascist regime. I had the opportunity to get a shirt of a club from Milan, and obviously I wasn't going to choose any of the plain Inter's kits. They told me it had been very easy to find the shirt because Milan has several stores around the city, and even a two-storey building called Megastore. I think this is the first shirt with a pocket on it I've ever seen, and I really really like it. I'm going to start focusing on Spanish teams and Asian teams. I suppose there will be more offers now that the season is ending... I have an eye on some shirts like Levante, LionsXII (from Singapore), Villarreal and some former Soviet countries.